Find Isabelle, Ranmir's lost love. 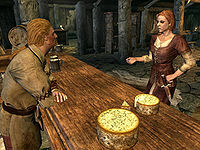 Speak with Haran to learn that Isabelle went to see Vex in Riften. Talk to Vex in the Ragged Flagon. Find Isabelle Rolaine in Hob's Fall Cave. Return to Ranmir with her note. "Please, come home. Just... Just come home." Birna: "Please, come home. Just... Just come home." Ranmir: "Can't. Got at least two rounds to go. Why don't you go... sell something." Birna: "Why? Because I'd rather be here trying to keep my only brother from drinking himself to death." Ranmir: "Ha! Drink ain't gonna kill me. Not today, anyway." Haran: "How long are we going to let Ranmir drink himself into a stupor? When will enough be enough?" Dagur: "As long as he keeps paying, I suppose. He keeps to himself, and isn't hurting anyone." Haran: "Are you so sure of that? I think Birna might disagree with you." Dagur: "It's not my place to get involved in their family's business, remember? You're the one that told me to stay out of it." "How long are we going to let Ranmir drink himself into a stupor?" 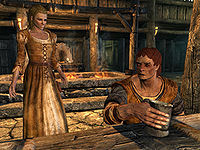 After helping Ranmir pay his debts to Haran, concerned innkeeper Dagur will have a new dialogue option, namely asking if there is anything to do around the inn. Dagur will then tell you about the very reason Ranmir became the town drunk: "Listen, we're friends, right? I wondered if I could ask a favor of you. It's about Ranmir. Don't get me wrong, I don't have a problem with him being here all the time. He mostly keeps to himself, and so far he's been able to pay. I just hate to see what's happened to him. He hasn't always been like this, you know. Drunk, I mean." He then proceeds to tell you about Ranmir's broken heart: "Oh, he was a different person. Happy, outgoing... Like anyone who's in love. See, Ranmir was involved with a pretty young woman named Isabelle Rolaine. The two of them were very happy together, I thought. One day, she just disappeared. Ranmir was convinced she'd run off with someone else, leaving him behind. He turned to drinking, and what's left of him is what you see here every day." He then reasons that if Isabelle could be found, Ranmir could get some peace of mind and get his act back together. When asked about Isabelle, Ranmir will get overly insulted, saying: "Don't you... Don't you say that name to me. Don't you dare. Ever." Luckily, the equally concerned Haran has a bit of information on Isabelle's whereabouts, although she will hint that Isabelle is hanging out with a bad crowd: "It's none of your business. Those aren't folks you want to get tangled up with." She will then explain the danger: "One night Ranmir was in here like always, drinking himself to death. 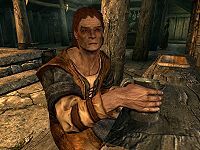 When I told him there was no more Honningbrew, that he'd drank it all, he got angry. He ranted at me, how I didn't know what he's been through, how Isabelle broke his heart when she ran off with some thief named Vex..."
If you are a member of the Thieves Guild, you already know master infiltrator Vex. She can always be found hanging out at the Ragged Flagon. If you have completed Taking Care of Business, she will even talk to you, and you will have the option to ask her about Isabelle Rolaine. When confronted with the name Ranmir, she will get exasperated: "Not him again. He came nosing around Riften a while back, making a lot of noise about me. He was... persuaded to leave before he found me. Funny, I'd have thought she would've gone back to him by now." Once she reveals she knew Isabelle, she will say: "She came through a while ago, wanted to know where she could get her hands on something valuable. Anything, really. I told her it was a bad idea, that she wasn't cut out for what'd be necessary, but she wouldn't hear it. So I gave her some advice, pointed her towards Hobs [sic] Fall Cave and that was that." Hob's Fall Cave is a small cave between Dawnstar and Ranmir's hometown, Winterhold. According to Vex, Isabelle went there to seek out treasure from the residing warlocks, but never made it far. As you approach the cave, stains of blood will lead to the entrance and right inside, you will find Isabelle leaning against a rock, dead. Examine her body and you will find her letter, her own full explanation for leaving her beloved Ranmir behind and seeking a fortune in a remote cave: "I know it's been hard on you, on both of us, struggling to survive. I hate to see the look in your eyes every time you think about how little the two of us have, and I know you're too proud to ever say anything. So I'm going to make it all better." Return to Ranmir and hand him the letter and watch while he reads it: "Don't you go pulling my leg. Give it here. This... This is really from her, isn't it? Did she really run off and do this? For me? By the Eight. She's dead, isn't she? And it's all my fault. I... I have some thinking to do. Thank you for this." Ranmir will then leave the Frozen Hearth, and vanish. The note is not marked as a quest item, and can be dropped like any normal item. This quest can become impossible to complete if you lose track of the note. If you enter Hob's Fall Cave before getting this quest, Isabelle's body is not there yet. It is not necessary to speak to Vex. Once the quest is started the body appears in the cave. There are several radiant quests that may use this cave. They can all be done simultaneously. 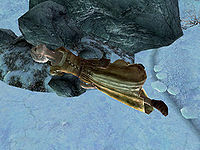 Ranmir disappears from the game after the quest (once you visit Winterhold exterior). The Unofficial Patch adds objectives to this quest. If Ranmir dies while this quest is running, it will appear to proceed normally except that you'll never be able to complete it. The last objective will be displayed with no map marker. The quest marker on your map may not show up, nor will it appear anywhere in your journal. Despite this, the quest itself will still be very much active once you talk to Haran. Sometimes Isabelle's body can be found in Hob's Fall Cave before getting the quest, but she doesn't have a note yet. ? Isabelle may be found in the cave without any clothes. Birna's dialogue after the end of Drowned Sorrows doesn't change to mention that Ranmir is gone. All of the quest stages are empty: 0, 10, 20, 30, 40. On the PC, it is possible to use the console to advance through the quest by entering setstage FreeformWinterholdC stage, where stage is the number of the stage you wish to complete. It is not possible to un-complete (i.e. go back) quest stages, but it is possible to clear all stages of the quest using resetquest FreeformWinterholdC.